US Coast Guards, "So Others May Live", is what The Guardian is about. Legend has it that there is a guardian that looks over the waters of the United States coastlines. Among the US Coast Guards is Ben Randall (Kevin Costner), a legend in his own right. He is the most decorated coast guard in the history of the US Coast Guards. He has the most records. Being dedicated to saving lifes does not mean the same as saving his marriage from what is already drowning. As Randall's wife made the decision to move away from him, he goes back to saving lifes in another dangerous mission. That night he loses his best friend and his entire crew in a freak accident. Unfit for duty after recovering from his injuries, Randall is sent to training school. There he calls the shot to a new batch of trainees, who among them is Jake Fischer (Ashton Kutcher), a cocky swim champ who intends to break all of Randall's record. During the weeks that follows the tough training regime, the trainees are sent packing one after the other from Randall's unorthodox training methods. His intention to narrow the gap between real situation and simulation. Despite seemingly picking on Fischer, Randall actually sees in Fischer someone who can be an outstanding coast guard. And in Randall, Fischer realised he has got a mentor. The film is inspirational. Saving lifes is a sacred task that is often overlooked. Often unsung. As Randall puts it, others do not appreciate their worth until they need to be saved. Teamwork is also much emphasised. 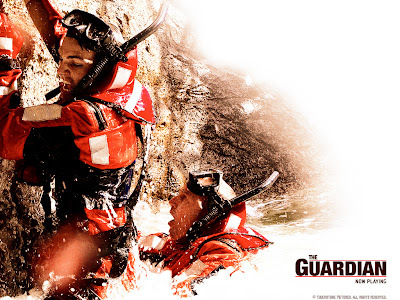 At the coast guards, teamwork is everything and the only thing. Being coast guards aside, there is the personal story of both Fischer and Randall. And every individual needs saving at one time or another. In The Guardian, we come to realised that at points of our lifes, we either play the rescuer or the rescuee. And we either drag someone down or pull someone up. That is not to say everyone can be saved. There are those we just have to let go. But who?